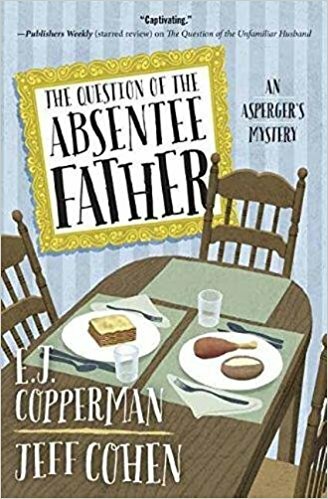 This week we have a review of The Question of the Absentee Father, and an interesting behind the book interview with Jeff Cohen. Details at the end of this post on how to enter to win a copy of The Question of the Absentee Father, and a link to purchase it from Amazon, and an indie bookstore where a portion of the sale goes to help support KRL. It was Samuel Hoenig’s mother who encouraged him to open Questions Answered, an investigation business that helped him to focus his unique observational and detailed-obsessed intelligence. It is also she who asks the one question he never expected, “Where is your father living now?” Twenty-seven years ago Reuben Hoenig left his wife and four-year-old son, and Samuel has always believed that his being on the autism spectrum was the cause. So it’s a shock to discover not only that his mother never divorced his father, but that he continued to make contact and send money. Although it has been years since she last heard from her husband, the ominous words in a new one spurs Samuel’s mother to ask her question, forcing Samuel on a mission away from comfortable home in Piscataway, New Jersey, and onto the distinctly foreign city of Los Angeles. As someone uncomfortable with anything that disrupts his normal rigid schedule, this is the first time Samuel must travel outside of the tri-state area. He never would have committed to flying to California if not for a disturbing call and the prodding of mother and his assistant, Ms. Janet Washburn. Samuel’s dedication to his mother, promise to answer her question, and the exhaustion of his local resources have him researching airlines, hotels, and restaurant menus in order to follow the investigation to Hollywood. There, Samuel and Ms. Washburn discover a confounding clue from the film “North by Northwest,” are protected by an armed Elmo, and become the unintended recipients of an enormous amount of cash. Fans of this stellar mystery series are again shown the strong, devoted bond between Samuel and his mother. It was she who struggled to raise Samuel alone, and without her, he would never have discovered the coping skills that make him such an effective investigator. Yet Samuel is unable to comprehend his mother’s attachment to the man who left them, a man whom the verbally precise Samuel refuses to acknowledge as his “father.” Samuel’s seemingly distant attitude isn’t caused by his personality traits, as he feels normal human emotions; the challenge has always been for him to express them in a “neurotypical” manner. The author continues his trademark humor and sardonic dialogue, with a chase on the 101 that is hilarious even as it satires expected CHP behavior. It is the exploration of Samuel’s emotional development that becomes the true highlight though, delving into moments of his past that have made him vulnerable today. Even in the time since this series began, the classification and awareness of Asperger’s has changed, and with these novels the author educates as much as he entertains. Events of the last book ended with a stunning occurrence, and yet another one here ensures that the wait for Samuel’s next adventure will be unbearable. KRL: You left the last book in this series on a bit of a cliffhanger. When you started the series, did you ever plan to head in this direction? Jeff: To be honest, I hadn’t thought that far ahead when I started the first book (and I know you’re referring to the Samuel/Janet dynamic and not a real plot-based cliffhanger). But I did want to explore what an adult with Asperger’s might feel like if he found himself starting a romantic relationship. I toyed with it in the second book when Samuel went on a “date,” but I knew that wasn’t going to last. KRL: The actual diagnosis of Asperger’s has changed throughout the years. Do you believe this is due more to the study of Autism, or simply to the public’s greater awareness of it? Jeff: The fact is, Asperger’s is no longer a recognized diagnosis. It’s now considered “autism spectrum disorder,” which I don’t really think helps much. All it does it narrow the number of people who can get funding for the assistance they need. KRL: When you started the series, did you have Samuel’s character progression planned out? Jeff: Absolutely not. I did want him to progress but I had no idea how long the series would last or what direction that progress would take so I couldn’t have anticipated anything. 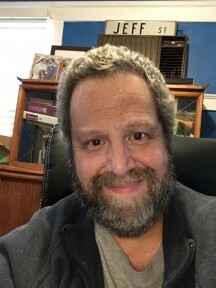 I wanted to show people that Asperger’s in particular – because I do not speak for any community and I am not an expert by any means – does not mean the person is incapable of growth or change. I also wrote a number of people on the spectrum into The Question of the Felonious Friend because I wanted readers to know the spectrum is truly that, a spectrum. It’s not just one thing. KRL: Has the development of the relationship between Samuel and Ms. Washburn surprised you, or was this your intention? Jeff: It sort of surprises me as much as anything can that comes from your own head. I’m not huge on outlining or planning. I’m a “pantser,” so I’m constantly surprising myself. But Samuel and Janet seemed like such a nice fit and she understands him so well. It’ll be interesting to see if and how they go on. KRL: The relationship between Samuel and his mother is unique and warm. What inspired you to write this? Jeff: He needed someone who would accept him unconditionally and who else is going to do that? Until the latest book, The Question of the Absentee Father, we never really know much at all about Samuel’s dad, so Vivian was going to be the person who fought for him all through school. His devotion to her is certainly understandable. KRL: Can you give any hints on what you see for Samuel and his Questions Answered business for the future? Jeff: No. I’m not being flip! I don’t know what’s going to happen to Samuel yet. There is a fifth book going through the process now, written but not published until next year. There’s some progress on personal fronts and some challenges professionally. No idea where anything’s going to end up. Not yet! KRL: How did movies shape your life? Jeff: I’m not certain they did. Movies are an important part of my life. I spent 20 years trying to sell screenplays because I thought that was my natural medium. Turned out I was wrong. I can’t say I was unaffected by all the movies I saw growing up and even today, although I can’t say I remember the last time a movie blew me away. I just don’t care about superheroes telling the same story over and over. I can’t deal with anything that doesn’t at least have a sense of humor about itself. So my books always will. KRL: Any idea how many more books there will be in this series, or how many you would like there to be? Jeff: The fifth book is in process. I have no idea after that. It’s really up to the publisher, and that means it’s up to readers because publishers are oddly in the business to make a profit! I’ll keep writing them as long as people want me to – I promise. To enter to win a copy of The Question of the Absentee Father, simply email KRL at krlcontests@gmail[dot]com by replacing the [dot] with a period, and with the subject line “absentee,” or comment on this article. A winner will be chosen November 18, 2017. U.S. residents only. If entering via email please include your mailing address, and if via comment please include your email address. I am a big fan of ALL of your series. Long may they be read! I haven’t read this author but would love to read this book. Thanks for the chance! This sounds like a great series! Thank you for the opportunity to win. I’d love to win a copy of E.J.’s new book to add to my collection. Cohen/Cooperman are a wonderful team. I am sure all the humor comes from Mr Cohen. This must be a terrific book. The Question of the Absentee Father is a book I have to read. Great review and interview! This is a series I have enjoyed. Thanks for a chance to win. Great interview! Haven’t read any of this series – yet!